1. First release of the year from Italeri is #1267, their USN HO4S-3, which is a re-box of their earlier #1206 Chickasaw (also re-boxed by Revell as their HO4S-3G, #04460). 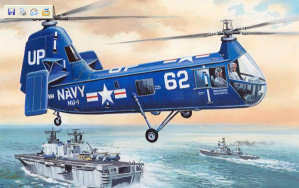 The picture on the back of the box shows two alternative schemes and markings, a blue USMC HRS-2 from Korea in 1953, and a dark green ALAT GH2 H-19 from Algeria in 1956. These are supposed to be new moulds, but time will tell what resemblence there is, if any, between these and the Interavia / MM / Siga kits. Following on from the very nice 1/48 LaGG-3, South Front has now released it's first 1/72 scale kit...the huge Mi-26 helicopter. The kit is big...but not as big as the box, which could easily hold two of the kits. That said, there are 233 crisp, clean, 'long run' injection moulded parts (including 21 in clear plastic) with fine engraved panel lines. You also get two decal sheets with markings for five helicopters...three Russian A/F., one U.N. and one Aeroflot. The kit has a fully detailed cockpit, main cabin floor, loading ramp and optional position rear doors, detailed landing gear and rotor head and separate engine intakes and exhausts. This is a very detailed kit of one of the largest helicopters in the world. 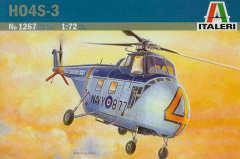 You'll find a bunch of new pictures of the kit here, thanks to Ken 'Flankerman' Duffy, and there are more in-progress build pictures in the ARCAir Helicopter Modelling Forum. 4. The Spielwarenmesse Nьrnberg 2007 show back in February produced a forthcoming release list containing many of the usual suspects announced many months or even years ago. The full list is available from IPMS Deutchland. One new name on the list is Hobby Boss from China, whose prodigous 2007 output is supposedly going to include all the following new moulds, all in 1:72. Hobby Boss have already released a good number of fixed-wing subjects in the last few months. As you can see from the preview pictures, they appear to be pretty good looking kits. We believe that Hobby Boss have actually been producing kits for Trumpeter until recently, or indeed may still be doing so. 5. Czech Master Resin have a new website, here we can see artwork for their long-awaited new Sycamore and the MD900 Explorer. 6. The Heliborne Mil Mi-24R Hind G-1 (Mi-24 RKhR) exterior detail set is now also available in 1:35, #35006, exclusively from Linden Hill, to go with the Trumpeter Hind #05103 and the Linden Hill decal sets #35002 ('Bush War Hinds-2') & 35003 (stencilling). The set contains 13 parts of 11 types - air conditioner intake, equipment pod (inner & outer parts), excavator claw x2, hydraulic bay x2, starboard door, starboard door glazing, skid, bumper, skid strut, and chaff dispenser. 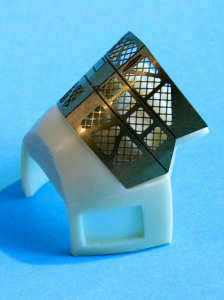 Features include accurately profiled surface of the air conditioner intake, engraved rivets to match those on the kit, raised screw caps on both claw parts, hexagonal main nuts on the hydraulic bays, U-shaped watershields above equipment hatches, clear vacuformed glazing, and the accurate shape of the newer tail skid. Pictoral instructions are included. 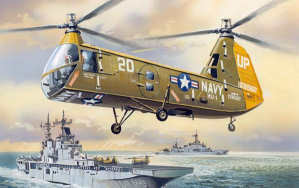 BIG3247, for the 1:35 Trumpeter CH-47A, including JX055 masks, 32552 interior, 32563 cargo seatbelts, and 32153 exterior. 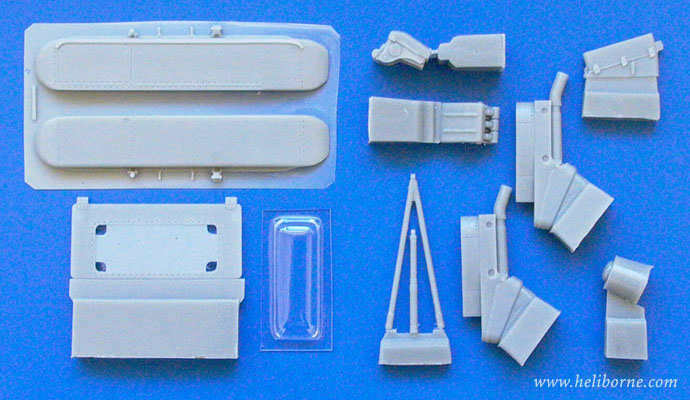 48558, exterior detail for the 1:48 Italeri ACH-47A, one sheet plain brass covering grilles, exhausts, details for u/c, rocket pod, machine gun, and rotorhead details, cover plates, and wipers. 72466, exterior detail for the 1:72 Italeri MH-53E Sea Dragon, two sheets of plain brass covering extensive underside details, grilles, aerials and antennae, details for winch, u/c, steps, exhausts, sponsons, rotorhead, etc. 8. Ciro have produced a new resin and brass exterior detail/conversion set #72019 for the KP Mi-4 Hound. 9. 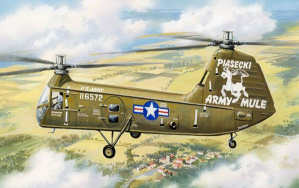 Due for release in June 2007, Trumpeter are making "Modern US Army Figures: CH-47D Crew and Infantry" #415. 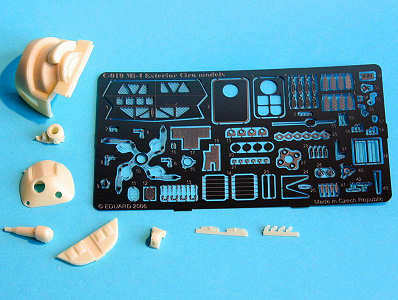 Designed for use with the 1:35 Trumpeter Chinook kits, this will have 95 parts on 7 sprues making five figures, and includes equipment, display base and a cockpit for use in making a diorama on the base provided. I thought I should bring you up to date of a few things that are going on here. I have a conversion/update set for the Trumpeter 1:48 HH-65A that includes an enlarged tail section and tail fan and a new nose for the HH-65C version. There will be a well-optioned decal sheet available separately. I also have an update for the 1:32 Revell UH-1 that will include the exhaust 'toilet bowl', an improved particle separator, engine cowl heat shields, and some other small parts. Both of these sets should be available in April. The K-Max 1:72 kit is on hold, pending the cockpit and some last little details to be finished. The release date for that kit is still open. For the latest information, check the Blog that's on the Fireball website. 11. Max Decals have issued a new set of Irish Air Corps decals #Max4814 featuring the Avro Anson and the DH.9. 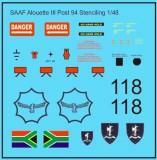 The sheet includes bonus markings for the new IAC EC135 in both 1:32 and 1:72. The prominent wire-cutters on the EC-135 can be obtained from versions of the Revell EC145 (1:32) or the Heller EC145 (1:72) scale. Both kits come with a number of marking options so you don't have to sacrifice an entire kit just to get the wire-cutters. 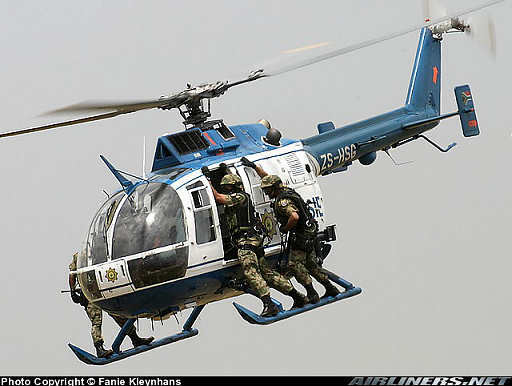 MAV-480139, SAAF Alouette II 22 / ZU-CXW. This is the restored and airworthy Allouette II at the SAAF Museum Swartcop. Just leave off the civil registration to make it as in operational service. An enormous selection of SAAF squadron badges and roundels is also available, as well as roundels for other African air arms. 13. 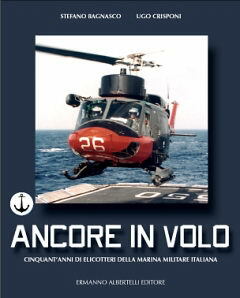 HKN now has a copy of the book Ancore in Volo, Cinquant'anni di elicotteri della Marina Militare Italiana 1956 - 2006 (Anchors in Flight, Fifty years of Helicopters in the Italian Navy), by Stephano Bagnasco and Ugo Crisponi, courtesy of the publishers Tuttostoria (ISBN 8887372586). 9 pages describing the history of the type in Marina Militare service, with lots of excellent photographs including early colour images. 2 pages of 3-view drawings in 1:72 scale including scrap-views of variants. 2 pages of colour profiles showing all the paint and marking schemes that existed; FS paint numbers included. 1 page table giving the details and history of each of the 20 aircraft, with construction number, MM number, Model (HSS-1, HSS-1N, etc), place and date of delivery, how acquired, original code number and paint scheme, historical notes, cancellation date and reason, final code number and paint scheme. 2 page colour walkaround, interior and exterior, of 4-14 / MM153622 which is preserved at Maristaeli Luni. The last chapter comprehensively discusses the availability of these types in model form (including the sad story of the A-106 kit that was announced by a Russian maker through HKN but never actually bought to production). The book is every bit as good as the publicity and its origins suggested it would be, it's a beautiful production that should be on every helicopter modellers bookshelf, or better still, in use on their workbench. You can get it direct from the AviationGraphic.com bookstore, or from the publisher. Thanks to Drew Graham, Tony Morgan, Stephano Bagnasco, Yevgeny Borissov, Ken 'Flankerman' Duffy and Joseph Osborn.